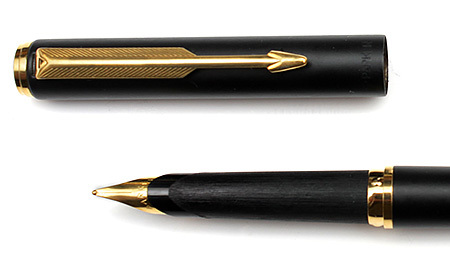 The Parker Arrow was introduced in 1981 as a executive mid range pen and featured an all new smooth arrow clip to go with the name. Early models were available in Brushed Steel with Chrome Trim, Brush Steel with Gold Trim, Rolled Gold, Matt Black and Chrome. In 1986 some lacquered versions were introduced including Black as well as marbled finishes such as Blue, Gray, Red and Green. The sharp points on the stylised Arrow Clip were renowned for catching on materials such as shirt pockets and could cause damage. 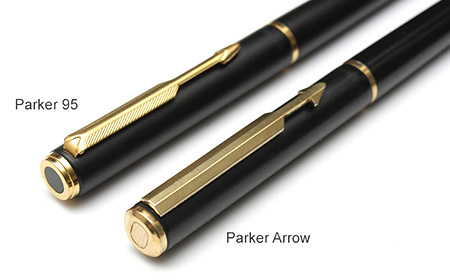 Eventually in 1987 the Parker Arrow was discontinued. The Parker 95 was released in 1988 a short while after the Arrow was discontinued and remained in production until 1994. It was for all intents and purposes the same pen as the Arrow with a redesigned clip and clip screw. 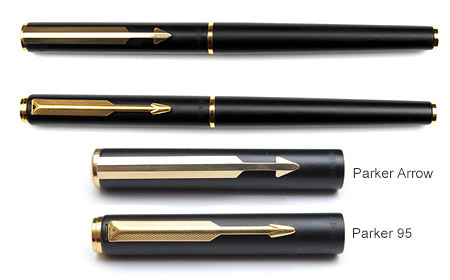 As can be seen, the main difference between the two pens is the arrow clip on the pen top with the arrow having a smoother more stylised arrow with sharp points on the triangular arrow head. The P-95 has a more detailed arrow with a more rounded arrow head and a redesigned clip screw with a stepped top and a circular centre as opposed to the Arrow's smoother top and its oval centre. Both pens used the same gold plated stainless steel nib on a textured shell section with a slightly hooded nib. Although the Parker 95 was discontinued in 1994 the similar Rialto and it's cheaper cousin the Parker Vector continued in production to carry on the lineage started by the Arrow into the 21st Century.